Almost everything we know about the owners and occupants of 109 – 117 Church Road comes from the deeds, but there are very useful additions from other sources. “Assignment of two Messuages called respectively Prospect House and Prospect Villa situate on Combe Down near Bath”. “Indenture dated on or about the twenty first day of June One thousand eight hundred and eighteen and expressed to be made between Joseph Ponting, Benjamin Wingrove & John Gabriel therein severally described of the one part and the said William Coles of the other part”. So, in 1818 115 and 117 Church Road were passed from Joseph Ponting, Benjamin Wingrove & John Gabriel to William Coles who was a carpenter. We have already touched on Benjamin Wingrove, but who were Joseph Ponting and John Gabriel? We know Joseph Ponting was a Captain in the Somerset Yeomanry as he appears as such alongside Benjamin Wingrove in the London Gazette of February 26th 1805. There is also a J / Jos / Josh Ponting who appears in the UK Land Tax Redemption 1798 for a range of properties in Norton St. Philip, Wellow and Woolley, who would seem to be a good candidate. 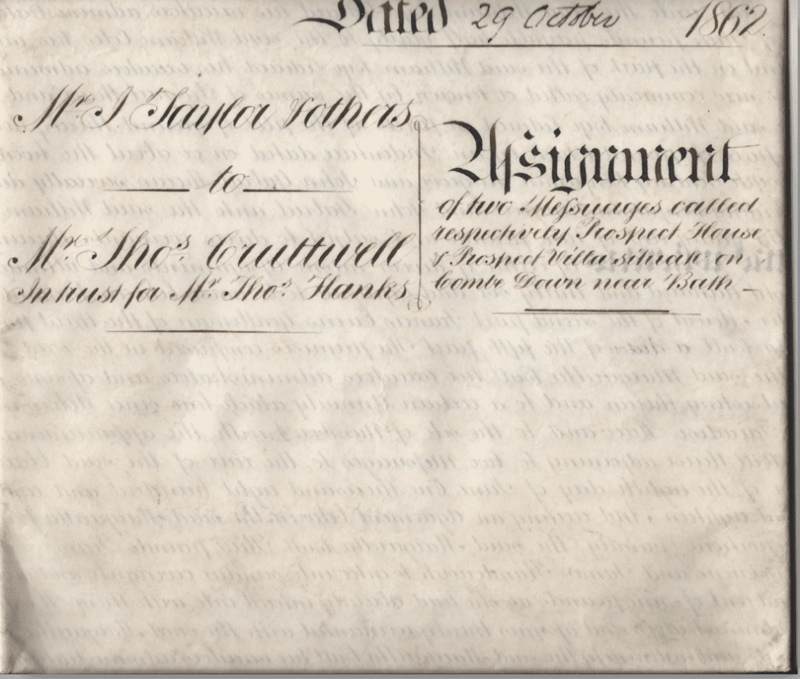 The will of a Joseph Ponting of the manor of Monkton Farleigh and Cumberwell dated 1822 in Wiltshire & Swindon Archives seemed likely to help but, apparently, has been misplaced. Thus I have been unable to establish whether they are all the same man and the man who appears in the deed, though it would seem likely. John Gabriel (1787-1825) was, almost certainly, the solicitor who was a partner in Atherton & Gabriel in Calne but his father was also called John Gabriel (1743-1824). As the son was more of a contemporary of Benjamin Wingrove perhaps he is the more likely? Atherton and Gabriel were solicitors and were also involved with the Calne, Hilmarton and Lyneham Turnpike Trust so those are both ways that Benjamin Wingrove could have come to know John Gabriel. Additoionally, Nathan Atherton became an owner of 113 in 1861 and his daughter Sabina Pool Atherton (1828 – 1913) married Charles Henry Gabriel (1821 – 1900) who was John Gabriel’s son. Other than that he was a carpenter, I have been unable to establish more about William Coles. “Indenture of Mortgage from the said William Coles to Elias Dyer”. Elias Dyer (1779 – 1852) was a baker and cornfactor known to be trading, in 1822, 1841 and 1848, from 32 Walcot Street. He was also a churchwarden of St. Michaels and appears as such in an article in Bath Chronicle and Weekly Gazette on Thursday 2nd October 1834 about the plans for the rebuilding of the church. He also owned land out at Bailbrook. “A Petition of Elias Dyer, praying that his Petition, complaining that the Standing Orders of the House, in respect to the application for the Bristol and Birmingham Railway (Bath Line) Bill, had not been complied with, may be withdrawn, was presented, and read; and referred to the Select Committee on Petitions for Private Bills”. A bill to build the line eventually passed in 1864 and the line was opened in 1869. From this it’s clear that Byfield Buildings and Prospect Place were in existence by 1819. As 113-117 Church Road also appear, from the 1836 advert above, to have been called 1 & 2 Prospect Place, this is somewhat confusing. William Bye Lidiard (1789-1858) was a Conveyancer and must have been known to Benjamin Wingrove. They appear in the same directory as conveyancers. He had offices in New King Street and later Corn Street and then 3 Wood Street and lived at 2 Norfolk Crescent. In 1821 he suffered a family tragedy. A runaway horse killed one of his children. It’s not clear, however, which of his children was killed. It seems likely to have been his daughter Sarah Louisa who had been born in 1814 as we can account for all his other children alive at the time of the accident. 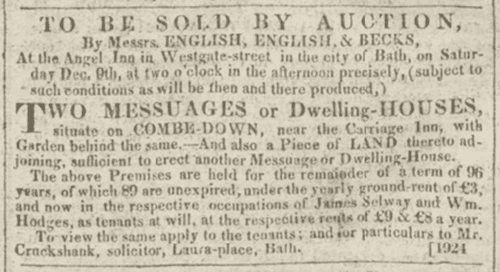 In December of 1820 there is an advert in the Chronicle about an auction to be held for 2 messuages, and some land on which another house could be built, on Combe Down near the Carriage Inn, though it’s not clear exactly which houses these are. Francis Ewens has been very difficult to track down. The issue is, partially, the ‘of London’ part of the phrase, as it’s very little to go on and could just mean he was living there for a while. 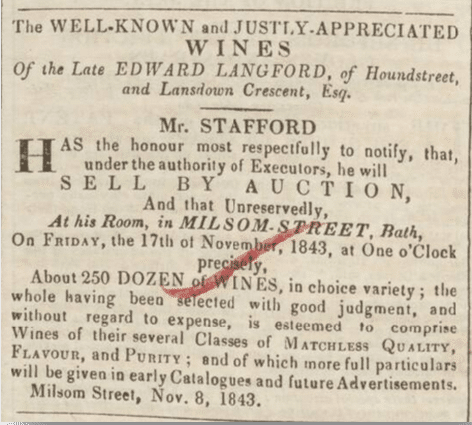 There was a Mr. W. Ewens who operated from Westgate Street as an ironmonger and placed a lovely advert in Bath Chronicle and Weekly Gazette on Thursday 3 May 1821 but, clearly that does not help. However there is a Francis Ewens (1776 – 1853) who was born in ‘Binstick’ (probably Burstock) in Dorset and died in Bath and who in the 1851 census gave his occupation as Gent. Proprietor of Houses, but he was given, in the census return, as a visitor to the house in Walcot. However his will makes clear that he was a licensed teacher. He sold it for £230. On the same date there was also an Indenture of Assignment made from the said Francis Ewens to the said Edward Palethorpe made for the mortgage for 115 and 117. One has to wonder whether the events of selling 113 and his interest in the mortgage for 115 and 117 and the death of his wife are correlated? Did he know his wife was dying and thus sell or was it just a coincidence? Moving back in time there was on 30th June 1834 an Indenture of Assignment made between the said Francis Ewens of the first part, Ambrose Heale Esquire of the second part and Thomas Macaulay Cruttwell Gentleman of the third part, from which it would seem that Ambrose Heal and Thomas Macaulay Cruttwell took on some of the mortgage on 115 and 117 from Francis Ewens. Ambrose Heal’s (1779 – 1837) grave can be found in the churchyard of St. Michaels in Monkton Combe. He was the son of Ambrose Heal (1748 – 1812) of Gillingham in Dorset, who owned lands there. His grandfather John was born in Maiden Bradley. His brother was John Harris Heal (1772 – 1833) who founded Heals of Tottenham Court Road the store and furniture makers. Ambrose Heal’s daughter Ann Standerwick Heal (1810 – 1890) married her cousin John Harris Heal (1811 – 1876) who was John Harris Heal’s (1772 – 1833) son. They in turn had a son called Ambrose Heal (1847 – 1913) and he too had a son called Ambrose Heal (1872 – 1959) who was knighted in 1933. 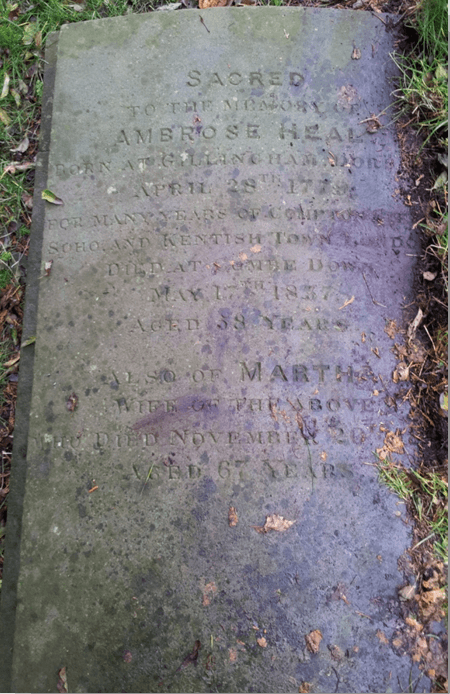 Ambrose Heal (1779 – 1837) spent many years in London in Kentish Town and Soho which are mentioned on his grave and the London Land Tax Records 1692-1932 and, from Dorset Land Tax Returns 1780-1832, he seems also to have received at least some of his father’s property in Gillingham. He also had a house in Gillingham called Newbury House. In London it seems he worked in partnerships with Roger Rood and Charles Nightingale for many years as can be seen from the extracts from The London Gazette for 1804 and 1830. It seems that at least one venture was in Old Compton Street as bedding warehousemen. Ambrose’s wife Martha Standerwick’s family owned a linen factory in Bourton in Dorset and a bed-tick warehouse in London so this may have been the reason. This may also have been the reason that John Harris Heal (1772 – 1833) chose mattress making when he set up Heals in 1810. He had moved to London in 1805 to work with a feather dressing company in Leicester Square. His idea was to introduce French style feather mattresses to England – a new concept as people were accustomed to sleeping on ticks and thin straw palliasses. Heals was originally at 33 Rathbone Place, London but, in 1818, they moved to 203 Tottenham Court Road as a ‘Mattress and Feather-bed Manufacturer’. In 1840 Heals moved to 196 Tottenham Court Road – the current site. Thomas Macaulay Cruttwell (1777 – 1848) was the second son of Richard Cruttwell (1747 – 1799) who owned The Bath Chronicle. Richard Cruttwell was the third child of William and Elizabeth Cruttwell. He was apprenticed to John Carnan, printer, of Elliot’s Court, Old Bailey, London, on 7th April 1761 and became a member of the Stationers’ Company on 4th October 1774. Richard Cruttwell (1747 – 1799) and his brother William had been left property by his great-uncle Richard Cruttwell in 1763 and moved West settling in 1768 at Bath, where he bought a share in the Bath Chronicle. The Bath Chronicle had started as The Bath Journal in 1843 printed by Thomas Boddely. It soon became Boddely’s Bath Journal and then The Bath Chronicle and Weekly Gazette. In 1761 it was renamed Pope’s Bath Chronicle and Weekly Gazette, then simply Pope’s Bath Chronicle in 1764. In 1768 it became Archer’s Bath Chronicle, then The Bath and Bristol Chronicle later that same year. In 1770 Richard Cruttwell bought it outright and made it R. Cruttwell’s Bath and Bristol Chronicle, before it became simply The Bath Chronicle just over eight months later. In the meantime his brother William had moved to Sherborne and established Cruttwell’s Sherborne Journal in late 1764 in opposition to the Sherborne Mercury, founded in 1737 and since January 1749 printed by Robert Goadby, a man with strong Whig sympathies. William Cruttwell remained the proprietor until his death in 1804. In late 1775, Richard Cruttwell (1747 – 1799) moved The Bath Chronicle to a house on the corner of St James’s and Weymouth streets and prospered as his printing and publishing business developed. He published, inter alia, John Collinson’s History of Somerset (1791) and two works on Bishop Thomas Wilson edited by his brother the Reverend Clement Cruttwell in 1784 and 1785. He was also one of the earliest publishers to issue local guides and, from 1770 to his death in 1799, he issued annually the New Bath Guide and in 1789 a guide to Cheltenham. Richard Cruttwell died at Cheltenham on 1 June 1799 and was buried in the family vault beneath St James’s Church, Bath, on 7 June. Richard Cruttwell’s eldest son (1747 – 1799) Richard Shuttleworth Cruttwell (1775 – 1843) took over The Bath Chronicle and Thomas Macaulay Cruttwell became a solicitor, as did his brother John. They worked in partnership at 5 Westgate Buildings and he lived at Perrymead Lodge. Thomas Macaulay Cruttwell was responsible for the development of Macaulay Buildings on Widcombe Hill on fields formerly called `The Nedges’. He purchased the ground in 1819, the first house was completed in 1825, the rest were finished by 1830. Thomas Macaulay Cruttwell of Bath, gent. Robert Cruttwell of Bath, gent. This also shows his involvement with the Stotherts of Stothert & Pitt fame. There is also a share certificate for Thomas Macaulay Cruttwell. Frederick Levick was employed to manage the ironworks. At the Great Exhibition of 1851, the then owners Cruttwell, Allies & Co. displayed pieces of iron forge and refined metal, puddled, merchant and beat bar iron plus a finished rail. By 1855 the company was operating three furnaces at the Coalbrookvale Ironworks. 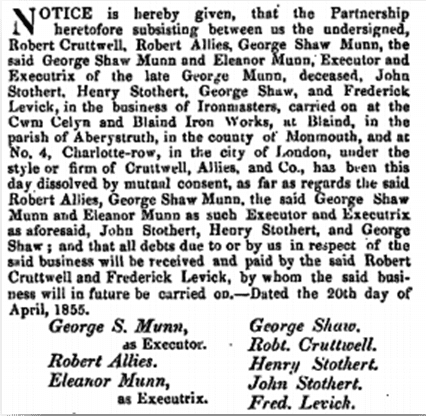 In the same year the partnership was dissolved except for Frederick Levick and Robert Cruttwell. 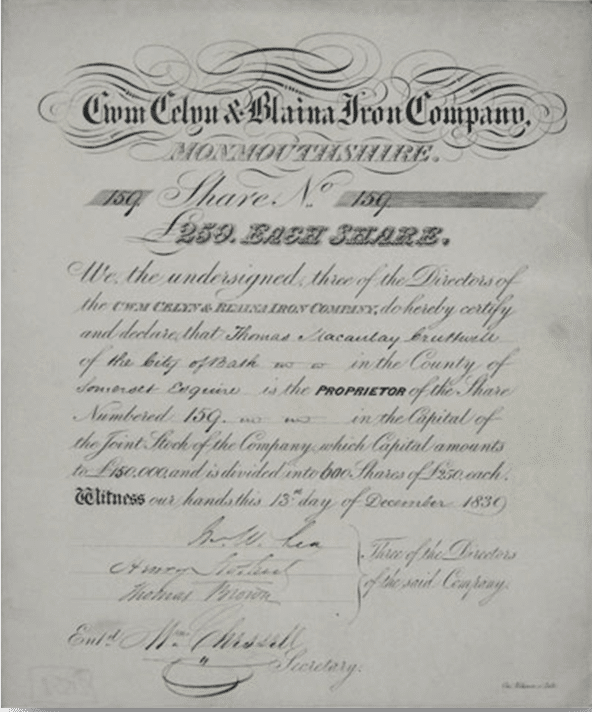 Frederick Levick and Robert Simpson became the owners of the three ironworks in 1858. The Robert Cruttwell mentioned is Thomas Macaulay Cruttwell’s son who was also a solicitor and who had joined his practice. He died in 1858. In the 1861 census another of Thomas Macaulay Cruttwell’s sons, and also a solicitor, Thomas Cruttwell (1808 – 1881) is shown to be living at Alma Villa (now Glenburnie) on Combe Down. He was involved with the conveyancing of 115 and 117 Church Road in 1862. “Indenture of Assignment endorsed on the last mentioned Indenture and made between Richard Falkner Banker Robert Jupe Upholsterer and Henry Ward of the first part the said Thomas Macaulay Cruttwell of the second part James Standerwick Gentleman of the third part Margaretta Bull of the fourth part and the said Francis Ewens of the fifth part”. It is not at all clear from the recitation in the later deed as to who exactly is assigning what to whom but it does bring in a number of new names. I shall leave Margaretta Bull pro tem as she has a bigger part in the story later and we have already heard of Francis Ewens and Thomas Macaulay Cruttwell. Richard Falkner (1796 – 1863) was a banker and a partner in Tufnell, Collett, Falkner & Co. This was the successor of a private bank established in Bath in about 1775 as Atwood, Abrahams, Collett, Salmon & Harris. Atwood was a surgeon, William Abrahams a clothier, Isaac Collett a wine merchant, John Salmon an insurance agent and William Harris an ironmonger. Now it becomes confusing as bank partnerships merged and separated though still give us a trail to the present day. Atwood, Abrahams, Collett, Salmon & Harris became Tufnell, Stroud, Collett, Payne & Hope from 1810 then Tuffnell, Collett, Payne, Watts & Hope and in 1815 Tuffnell, Collett, Payne & Hope. In 1825 the firm of Tufnell, Collett, Payne & Hope was dissolved and restyled Tufnell, Collett & Co. separating it from Payne & Hope’s Wells Bank (est. 1800, failed 1831) run by the same partners. Tufnell & Falkner Bank had been set up in 1783. It became Tufnell, Falkner & Falkner from 1812. There was also Tufnell, Collett, Falkner, Ponny & Falkner also known as Bladud Bank. From 1821-1825 there was also a Falkner, Penny and Falkner partnership. From 1829-1835 Falkner, Penny and Falkner became Falkner, Penny, Falkner and Tuffnell. Then Falkner, Penny, Falkner and Tuffnell merged with Tufnell, Collett & Co. and became known as Tufnell, Collett, Falkner & Co. and opened a branch in Chippenham in the 1830s. The partners were Richard Falkner and Francis Henry Falkner when the bank was acquired by Stuckey’s Banking Co. of Langport in 1841. Stuckeys was the second joint stock bank to be formed in the country. It was created in 1826 by the amalgamation of three Stuckey family banks – Stuckey, Lean, Hart & Maningford of Bristol, S & G Stuckey & Co. of Langport, and Stuckeys & Woodlands of Bridgwater – along with the private Bristol bank of Ricketts, Thorne & Courtney. 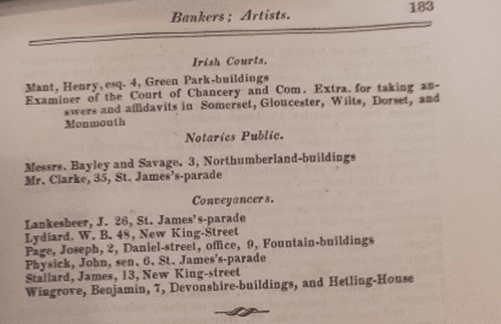 The banks continued to trade under their separate names until 1828 when all became part of Stuckey’s Banking Co. In 1909 Stuckey’s Bank amalgamated with Parr’s Bank. In 1918 Parr’s Bank Ltd. amalgamated with London County & Westminster Bank Ltd. of London, to form London County Westminster & Parr’s Bank Ltd. That bank’s name was shortened to Westminster Bank Ltd. in 1923. In 1968 Westminster Bank Ltd. announced plans to merge with National Provincial Bank. The two banks continued to operate separately until 1 January 1970, when they became National Westminster Bank. In March 2000 National Westminster Bank was acquired by The Royal Bank of Scotland Group but continued to trade on the High Street under the NatWest brand. The Bath branch of NatWest is still known as Bath Stuckeys branch. Robert Jupe, Upholsterer is another very interesting character. Robert Jupe (1791 – 1841) was the son of Robert Jupe (1757 – 1834) and born in Gillingham, Dorset. He and Ambrose Heal must have known each other from both the Gillingham and the furniture connection. Robert Jupe (1791 – 1841) may have described himself as an upholsterer, but he was a great deal more. He too had made his way to London and on 11th March 1835 he was granted a patent for an improved expanding table. He was also granted a patent on 9th October 1835 for improvements in ornamental dessert, flower and other stands. "An improved expanding round table so constructed that the sections composing its surface may be caused to diverge from a common centre and that the spaces caused thereby may be filled up by inserting leaves or filling pieces." The table top could be expanded “by hand or by turning the surfaces and bed of the table round the pillar.” The table’s leaves could be added and then removed to accommodate different numbers of guests. It is said that Robert Jupe and John Johnstone had a falling out. Their partnership was dissolved  in December 1839. Robert Jupe moved his business to 47 Welbeck Street, Cavendish Square and John Johnstone formed a new business at 67 New Bond Street called Johnstone & Jeanes in 1842. Robert Jupe’s expanding tables have become very sort after. In 2013 a Johnstone & Jeanes mahogany expanding dining table c.1850 sold for $122,500 (£74,948) including premium. 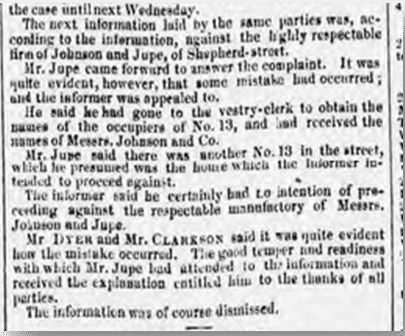 In 1839 Jupe was involved in a case of theft by one of his staff. Lucy Tucker was indicted for stealing, on the 28th of June, 1 spoon, value 6s. the goods of Robert Jupe, her master. From the cutting it’s fairly clear that Lucy was no criminal mastermind as the spoon she stole seems to have had Robert Jupe’s name on it and was recognized at the place she tried to sell it. She still got 3 months. Henry Ward is such a popular name that I have been unable to establish who this one was with any certainty. There was a Rev. Henry Ward (1795-1874) in Bath at that time and John Gabriel (1787 – 1825) the solicitor who had been a mortgagor had married an Elizabeth Anne Ward (1784 – 1866) so he may have been a member of her family. "Draft mortgage, principal: £400, of leasehold, plot of land, 77 feet by 998 feet, and house called Claremont House; also plot, 36 feet by 88 feet and two messuages; also Colliver's Quarr Down, 21 feet by 77 feet; all on Combe Down, Monckton Combe, Somerset between James Standerwick of New Basinghall Street, London, Wine Merchant, Edward Browne of Bath, surgeon & Edward Langford of Walcot, esquire." Once again this is after the auction, this time about a year, so perhaps James Standerwick had taken a shine to property on Combe Down? Or maybe it was just an investment decision? "NOTICE is hereby given, that James Standerwick, of No. 30, London-wall, in the city of London, Wine Merchant, hath by indenture of assignment, bearing date the 21st day of September 1842, and made between the said James Standerwick, of the first part; John Atkinson, of No. 5, New Basinghall-street, in the city of London, Esq. and John Gray, of New London-street, Crutchedfriars, in the said city of London, Wine Merchant, trustees for themselves and the rest of the creditors of the said James .Standerwick, of the second part; and the several other persons whose names and seals are thereunto subscribed and set, being severally and respectively creditors of the said James Standerwick, of the third part; assigned and transferred, in manner therein mentioned, unto the said John Atkinson and John Gray, their executors, administrators, and assigns, all and every the stock in trade, goods, wares, and merchandizes, household furniture, plate, linen, china, books of account, book debts, sum and sums of money, and all securities for money, and all and every other the personal estate and effects, whatsoever and wheresoever, of him the said James Standerwick upon trust, for the benefit of all the creditors of the said James Standerwick; that such deed was duly executed by the said James Standerwick on the said 21st day of September 1842, and also by the said John Atkinson and John Gray on the 5th day of October 1842; the execution whereof by the said James Standerwick and John Gray, respectively, was attested by Joseph Addison. McLeod, of No. 16½ , Billiter-street, in the city of London, Solicitor; and the execution whereof by the said John Atkinson was attested by Benjamin Stenning, of No. 16½ Billiter-street aforesaid, Solicitor; and notice is hereby further given, that the said deed now lies at the office of Messrs. McLeod and Stenning, of No. 16½ Billiter-street aforesaid, Solicitors, for execution by such creditors as have not yet executed the same, and unless they forthwith execute the same, or assent thereto, they will be excluded all benefit to arise therefrom; and all persons indebted to the estate of the said James Standerwick are requested forthwith to pay the amount of their respective debts to the said Messrs. McLeod and Stenning. Dated this 13th day of October 1842." Thus far all I have been able to establish about Edward Browne is what is stated – that he was a surgeon! Edward Langford (1777 – 1843) came from an established and well connected family: the Langfords of Trungle and Penzance. He had become a Captain in the Royal Cornwall Militia and then the 49th Foot. His aunt, Constance, had married Capt Samuel Pellew and one of their sons was Adm Sir Edward Pellew, 1st Viscount Exmouth, GCB (1757 – 1833) and another Adm Sir Israel Pellew, KCB (1758 – 1832). Edward Langford’s son Thomas on 11th February 1835 married Caroline St. Leger the niece of Hayes St. Leger, 2nd Viscount Doneraile (1755 – 1819) who was related to Major-General Anthony St Leger (1731 – 1786) the founder of the St. Leger horse race in 1776. He rented Hunstrete House (or Houndstreet House) from the Popham family where, in 1822, one of his servants had died and been buried and then disinterred before the verdict that he had had met an accidental death was given. He was a supporter for Col. William Gore Langton (1760-1847) of Newton Park for his re-election to parliament for the county seat of Somerset, in 1831, on a reform platform to establish a more representative House of Commons by getting rid of ‘rotten boroughs’ and granting seats instead to the larger cities. 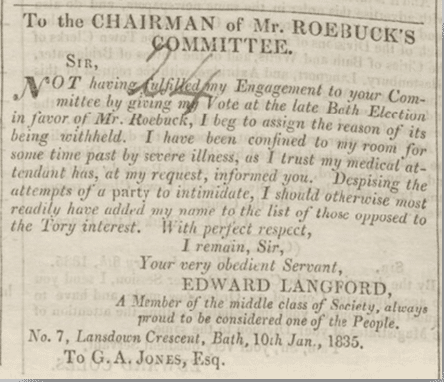 He also supported John Arthur Roebuck (1801-1879) who, on 14th December 1832, was returned by Bath to the first reformed parliament, though he did not vote as he was unwell and so felt the need to send a letter of apology ‘To the Chairman of Mr. Roebuck’s Committee’ via the Bath Chronicle on Thursday 15th January 1835. We also have details of the contents of his home and of his wine cellar of 250 dozen wines (yes, 3,000 bottles!) which were auctioned after his death; the contents by Messrs. English and Fasana and the wines by Mr. Stafford. It is possible that his name has been misspelled and that he is Edward Luckman rather than Edward Lucknam. There was an Edward Luckman (1801 – 1885) who was a successful schoolmaster. From about 1830 he owned and ran a boarding and day school at 8 James Street, followed by a short period in Prospect Place. In 1846 he moved the school to the original Devonshire House on a 21 year lease. It had been the “Classical Boarding Academy” run by R A Lawrence. After that lease ran out Devonshire House became The Somersetshire Certified Industrial Home for Boys, a school for young offenders under the Industrial Schools Act of 1857 but that moved to Walcot in 1878 and Brougham Hayes in 1881. 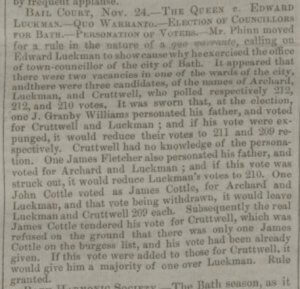 Edward Luckman was also a town councillor but had some issues with his votes and being issued with a writ of Quo Warranto. There was Alexander Mowat Snr. (1796 – 1864) and his son Alexander Mowat Jnr. (1819 – 1889). Alexander Mowat Snr. (1796 – 1864) was a ‘Watch & Clockmaker’ based at 7 Quiet Street the business having been established in 1790. Alexander Mowat Snr. was born in Grainsby in Lincolnshire but was by 1835 living in Bath and continued to work here until he died. It is likely that it was him that was the trustee. Alexander Mowat Jnr. 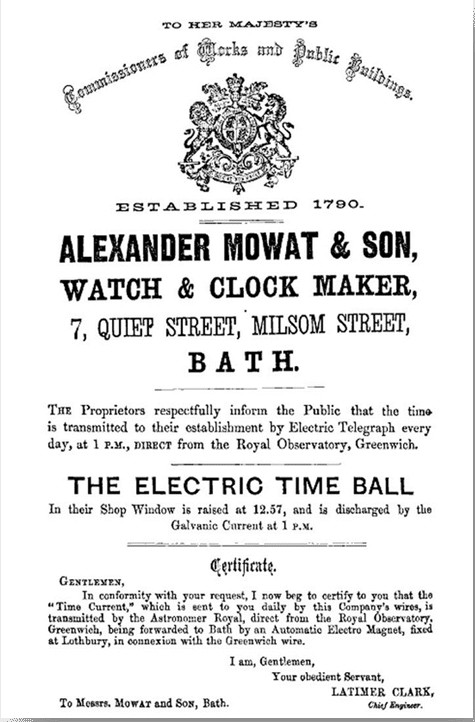 was born in Bath and was also a watchmaker. 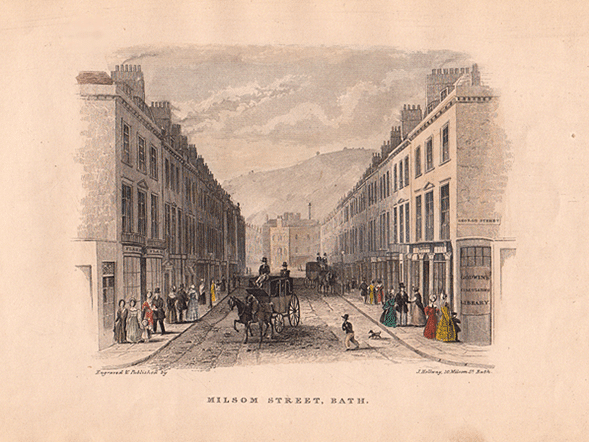 He was living and working in Bath at the 1861 census, though, according to The London Gazette, they had dissolved their partnership on Thursday 7th April 1859. After his father died there is a report in The Bath Chronicle for Thursday 19th January 1865 where Alexander Mowat Jnr. was brought up on a charge of conspiracy to defraud in a case that was reported on again on Thursday 26th January and Thursday 13th April and became known as ‘the gold chain conspiracy’. It seems he was duped into selling a worthless chain by Edwin Sherry and William Brittan who substituted a real gold chain with a brass one at some point in the transaction. The case against him was dropped and they got 12 months each. Alexander Mowat Jnr. subsequently launched a case for false imprisonment reported in The Bath Chronicle on Thursday 17th August against Samuel Goodman the jeweller who was defrauded which he won with damages of 40/- but his request for costs was turned down. By the 1881 census he is living in Clerkenwell and died in London. So, we have seen the relatively wealthy people who invested in the mortgages that helped to build housing on Combe Down and elsewhere. Most of them, however, did not live on Combe Down and probably thought about it rarely. Now let’s look at what else was happening and who lived here in the houses.